Provided below are some of the questions and answers that arise from the final disposition of the historic Atlantic Coast waste flow control litigation. This page should facilitate understanding about Morris County's flow control elements. Click here to read the NJDEP's most recent (July 27, 2016) certification reaffirming the Morris County Solid Waste Management Plan and its waste flow control elements. Q. 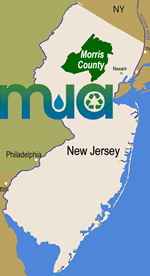 Is flow control in effect in Morris County with the MCMUA award of a 5-year disposal contract? The MCMUA consulted with its attorneys, Maraziti, Falcon, L.L.P., and they have concluded that the MCMUA continues to have the legal ability to direct all non-hazardous solid waste (waste types 10, 13, 13C, 23, 25 and 27) generated within Morris County to the MCMUA transfer stations. Additionally, the MCMUA intends to take all steps necessary to enforce its constitutional ability to direct solid waste flow to its transfer stations. Click here to read the New Jersey Department of Environmental Protection's (NJDEP) July 27, 2016, certification of approval of the 5-year disposal contract between the MCMUA and Solid Waste Servuices, Inc. d/b/a J.P. Mascaro and Sons, which reaffirms the Morris County Solid Waste Management Plan and its waste flow control elements. This contract was executed February 20, 2015 with work under the contract beginning June 1, 2016 continuing through May 31, 2020. Q. Can Morris County waste type 13C (construction and demolition debris) be processed at a material recovery facility (MRF) to separate recyclables from disposables? What if the MRF returns the residual waste to Morris County such as what used to be allowed under NJDEP's former "mixed loads rule?" The MCMUA maintains regulatory flow control over solid waste generated in Morris County, including waste type 13C construction and demolition debris (C&D). On July 27, 2016 the NJDEP certified an March 9, 2016, amendment to the Morris County Solid Waste Management Plan approving the MCMUA's transfer station operations, transportation and disposal contract that was procured in an open, fair, competitive and non-discriminatory bid process. As such, the Plan's inclusion of regulatory flow control over solid waste types 10, 13, 13C (underlined and provided in bold-face font for emphasis), 23, 25 and 27 generated in Morris County is also certified by the Department meaning that these waste types are required to be delivered to one of the two MCMUA transfer stations located in Mount Olive and Parsippany-Troy Hills Townships for disposal. Source-separated recyclables are not regulated by flow control and therefore, if Morris County waste generators separate recyclables from disposables at the point of generation, the source-separated recyclables can be delivered to a facility for the purpose of recycling. It should be noted that if the recycling facility has the capabilities, the source-separated recyclables can be mixed with each other for delivery to such a recycling facility. For instance, recyclable Sheetrock(TM), wood, metal, etc., may be mixed together after being separated from disposables at a job site and delivered to a materials recovery facility with sufficient capabilities for the recycling of this material. Only the garbage generated at the site is required to be delivered for disposal to the MCMUA transfer stations. In the compliance section of the July 27, 2016, NJDEP certification, the Department specifically states, "All solid waste facility operator and transporter registered with the Department and operating within the District and affected by the Amendment shall operate in compliance with this Amendment and all otherapproved provisions of the County Plan. Any facility operator or transporter who fails to comply with the provisions contained herein shall be deemed to be in violation of N.J.S.A. 13:1E-1 et. seq., in violation of N.J.A.C. 7:26-1 et. seq., and in violation of their registration to operate a solid waste facility or a collection system issued thereunder by the Department and shall be subject to the provisions and penalties of N.J.S.A. 13-1E-9 and 12 and all other applicable laws." Click here to read the	July 27, 2016, NJDEP certification reaffirming Morris County's waste flow control elements. With respect to the return of residual solid waste, the material remaining after the extraction of recyclables at a MRF for recycling, the MCMUA has not entered into any such arrangements with MRFs and does not participate in this type of activity based on the former "mixed load rule." Please note that in the definitions section of New Jersey's recycling regulations (N.J.A.C. 7:26A-1.3) it states that "Beneficial use" means the use or reuse of a material, which would otherwise become solid waste, as landfill cover, aggregate substitute, fuel substitute or fill material or the use or reuse in a manufacturing process to make a product or as an effective substitute for a commercial product. Beneficial use of a material shall not constitute recycling or disposal. Q. How did Morris County retain waste flow control after the U.S. Supreme Court decision regarding Atlantic Coast in the late 1990s? The courts decided waste flow control can be permissible if the solid waste management system (System) to which waste is being directed to was procured in a non-discriminatory manner. Morris County procured its System, consisting of out-of-state landfill capacity and two in-county MCMUA transfer stations, in a non-discriminatory manner. In January 1998, and time and time again up through the 2016 contract with JP Mascaro, the NJDEP agreed with this and therefore reaffirmed the waste flow control requirements previously included in the Morris County Solid Waste Management Plan. With this NJDEP approval, all solid waste types 10, 13, 13C, 23, 25 and 27 generated in Morris County continue to be directed to one of the two transfer stations prior to transport to designated disposal facilities. Q. Is waste flow control in Morris County good for Morris County? Waste flow control is planned for and helps support the existing Morris County Solid Waste Management Plan (Plan) and system. This system serves Morris County’s municipalities well by providing economic, convenient, reliable and environmentally sound access to solid waste disposal and other support services such as recycling, composting, household hazardous waste disposal and more. In addition, the Plan has secured long-term access to these services while currently assuming no solid waste debt like many counties surrounding Morris County. It is the type of solid waste management system that businesses and towns can budget on, and plan around while not worrying about anything coming back to haunt them. Limiting a municipality's contingent environmental liability exposure. Provide long-term security from tipping fee increases over the rate of inflation. Infrastructure designed and located to serve Morris County and its municipalities. An implementing agency, the MCMUA, who can be trusted, protects the environment and whose history shows it limits costs while increasing services for Morris County and its residents, businesses, and municipalities. Q. Is there an advantage to utilizing the Morris County solid waste disposal system from a contingent liability perspective? An advantage that is difficult to quantify, but is nonetheless very substantial, arises from the use of the Morris County waste disposal system. Under federal and state environmental laws, the generator and arranger for the disposal of hazardous waste is jointly and severally liable for the clean up of any releases of such materials. In recent years, many Morris County municipalities have been joined in litigation regarding the clean up of landfills to which municipal waste was delivered many years ago. Exposure to such liability can be substantially reduced by the use of the MCMUA system for a variety of reasons. First, when the MCMUA selected the contractor and disposal site (landfill) for the disposal of Morris County’s waste it did so in accordance with exacting environmental due diligence standards, and the MCMUA chose a facility with state-of-the-art environmental safeguards. Additionally, the owner of the facility, has provided the MCMUA with an expansive indemnification of environmental liability. Use of identified, approved and limited number landfills offering such protections is overwhelmingly safer than running the risk that the waste generated in the municipality may be disposed of at a variety of different landfills over the course of a year, or, for that matter, a month or even a week. Such scattered disposal practices may be the case with haulers who offer a deceptively attractive rate because they "play" the spot market. For a public body with significant financial resources to protect, such multiple exposure is especially dangerous, particularly given the magnifying impact of joint and several liability. These contingent liability concerns are more important now than they have ever been. Historically, the exposure of municipalities to the financial impact of environmental litigation for solid waste disposal has been dulled by the benefits of liability insurance. Not only have insurance companies paid the settlements and judgements that have been awarded for the disposal practices of decades ago, but they have also paid the sometimes heavy cost of legal and engineering fees that accompany the defense of such litigation. In the future, such expense will come directly from the municipal budget because insurance policies written since the mid-1980s explicitly exclude coverage of such claims.